Early in 2002 while I was doing some shopping in Banbury, North Oxfordshire, I visited the Tourist Information Office and obtained copies of the various walks published by the local council, Cherwell District. 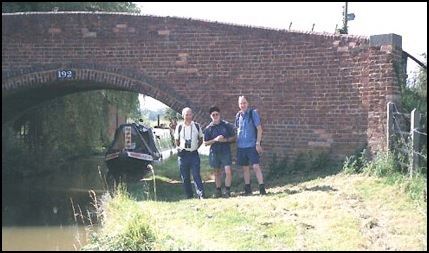 Shortly after Mick, Larry and I used one of the routes, which was a 10 mile circular walk of Banbury. It wasn’t particularly wonderful. Some of the outskirts of towns can be a bit grim although the countryside parts were pleasant. However, we enjoyed it and were impressed by the clarity of the information given on both the walk details and the actual walk signage. Early in August (2002) it was decided that we, the "Boys", should get out and have another walk. Where we went was almost immaterial as long as it was no more than a couple of hours travelling to get there and a suitable hostelry was available for mid day refreshments. Searching through various information I came across one of the previous mentioned Cherwell District Council walk leaflets which detailed two walks, both of which started from Deddington, which is located 6 miles south of Banbury at the junction of the A64260 and B4031. All the "Boys" agreed that this would be suitable for a summer excursion so by 9.15 on a beautiful sunny morning Mick, Peter, Larry and I were to be found putting our boots on outside the Unicorn Pub in the centre of Deddington ready for our morning walk, a 6 ½ mile circuit (the Clifton Loop) which took us to the east of the town. I understand that in medieval times Deddington was a thriving market town but today it seemed very sleepy, almost a forgotten backwater. We liked the look of it very much with its public houses situated around the market square and no parking restrictions or charges. This later fact really went down well with Mick who hates paying for parking. By 9.30 we were away and having walked south out of the town we were soon on farm tracks and footpaths enjoying the scenery and sunshine. After about half an hour, near a packhorse bridge, which crossed South Brook, we started north for our first stop of the day, the small village of Clifton. We had hoped to find a seat here to rest our legs for a while and enjoy elevenses. The only seat we saw was in the bus shelter, but there was room for four – just - and it was cool inside, so various non alcoholic beverages and snacks were consumed to ensure we didn’t suffer hunger pains before lunch. It was then that we realised that we had made better time than expected and would be back in Deddington well before noon and probably before the pubs opened. All of us felt it would be embarrassing to wait for a pub to open so it was decided that we would take a minor detour of about a mile to the Oxford Canal. Having walked cross field tracks to the canal, we went a short distance north along the towpath before going back into Clifton via the B4031. We all enjoyed this detour. Walking along the canal was very pleasant, however, Larry was slightly nervous when one of the fields we passed through to get there had a sign that said "Beware of the Bull". We didn’t see one. Was this an attempt by the landowner to keep people off his land? I don’t know but Larry got a bit hotter and I’m sure it wasn’t just because the sun was now getting up to full power. From Clifton we went north past Hazel Hedge and on towards Paper Mill Cottages which were a few yards north of our route and was the base for a local paper manufacturing operation in the late 18th to mid 19th century. This was the only point during the day when we were let down by the signs but a quick review of the walk details soon got us on the right course. Now the temperature was really warm and for the next mile or so it was uphill all the way. Needless to say it was pleasing to reach the top of the ascent – a good excuse for a refreshment stop, and for Mick to take his shirt off, before the walk south back to Deddington. Soon after 12.15 p.m. we were in the Unicorn Pub and enjoyed a very pleasant lunch. We took advantage of a special offer, of 4 pint jugs of Hook Norton Bitter for the price 3. At less than £1.50 a pint we thought this was excellent value and certainly Mick and Larry are intending to make another visit there. 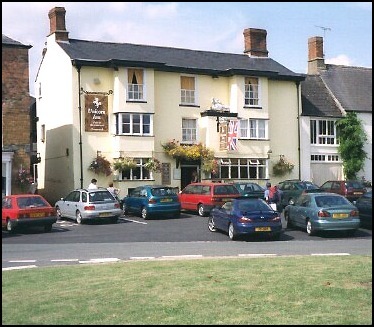 We also enjoyed the food and considered the 2 course meals we had for less than a "fiver" good value and after a long and heated discussion (not) decided to have another jug of Hook Norton. Having enjoyed our refreshments in the sun and feeling relaxed we were therefore a little reluctant to leave the pub’s garden to do the 5 ½ miles of the Hepton Loop that traversed the countryside to the west of Deddington. But we are hardy souls so continue we did. Normally we all carry rucksacks for food, drink, waterproofs etc. However, we were well fed, it seemed unlikely to rain so for the afternoon’s ramble we travelled light. Drinks and cameras only. Fortunately I had brought a waist bag with me, which was ideal for my water and waterproof - I was pessimistic about the continuation of the fine weather. Soon this seemed to get heavy. Larry and Mick obviously considered I needed more exercise and slipped their water bottles into my bag. Lazy s*ds. However, I realised that the additional weight was unlikely to slow me down that much and, even if it did, because of the heat Mick and Larry would invariably wait for me when they needed their water. We probably enjoyed this loop more than the morning's exertions. We initially went west out of the village and after about a ¼ of a mile went north to Daeda’s Wood, which we walked through before taking an uphill lane (Milton Road) north west. Just before the brow of the hill we turned left to Coombe Hill Farm. 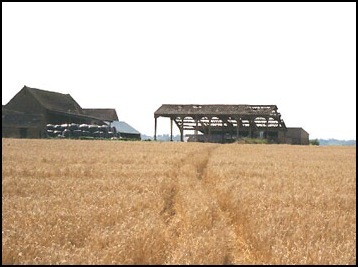 Here we saw the damage that must have recently occurred when a barn went up in flames. Must have been quite an inferno and would have been seen for miles. 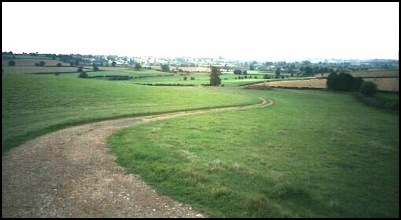 From here we followed the track downhill where,The track between Coombe Hill Farm and the old mill on the River Swere. 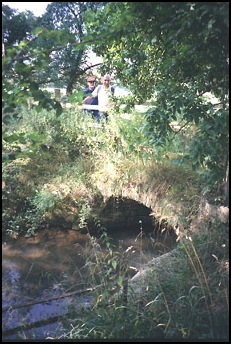 by an old mill, we met up with the River Swere. An idyllic setting, which was being enjoyed by fishermen. 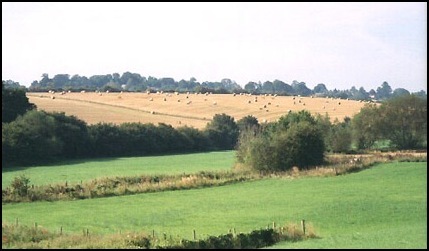 From here it was across a couple of fields and south along Snake Hill Lane to the B4031. Here we turned left (east) and after about ¼ mile turned right towards Tomwell Farm. Half a mile down the track we turned left and followed a path that took us across fields before reaching Deddington once more. We all enjoyed the walk, especially me as I almost always find myself doing the navigation. Today was no exception but the walk leaflet and signage really made it very easy. Larry intends to do one of the "loops" again with a group of ladies he takes for Sunday strolls. And I think both Mick and Peter will be considering walking parts of North Oxfordshire again. Monday, 22 April . . . . . . Copyright © 2001-2019 Barry Riley.